With a bachelor’s degree in healthcare administration (or a closely related field), you will be qualified to work in a diverse range of employment settings, from military healthcare facilities to pharmaceutical companies. Individuals in these environments often work as planners, managers, technicians, and administrators; however, for those who want to advance into the upper echelons of senior management, it will be necessary to pursue higher education in the form of a master’s degree or Ph.D. Even after obtaining a postsecondary education degree, healthcare administrators must continue to seek ongoing education because of the fast paced, constantly evolving nature of the healthcare industry. For example, many professional organizations for healthcare managers offer professional certifications that enable a healthcare admin to specialize in niche fields within their industry. The primary advantage to pursuing continuing education for healthcare admins is that it makes them marketable for raises and promotions; however, much satisfaction can be derived from knowing that their learned knowledge is being used to provide patients with the best healthcare available. There are numbers of healthcare related master’s degree programs to choose from, but the most common one in the United States is the Master of Healthcare Administration degree. The average annual income for a healthcare executive with an MHA degree is between $82,000.00 and $117,000.00. On average, an MHA degree will take two to four years to complete, depending on if you attend school part time or full time. There are hundreds of MHA degree programs in the U.S. to choose from, but it is imperative to do your research before applying to a university’s MHA program. Most importantly, you will want to ensure that the program is accredited by the appropriate professional bodies. Ph.D. programs, on average, take between four to seven years to complete. These highly advanced degrees are primarily pursued by those who want to enter academia or who aspire to become high-ranking healthcare execs (e.g. CFOs, CEOs, etc.). The most common “three letter” administration degrees are Ph.Ds (Doctor of Philosophy), ScDs (Doctors of Science), DrPHs (Doctor of Public Health), and DHAs (Doctor of Health Administration). These degrees primarily differ from one another based upon the university or college where the program is offered. However, they also differ in terms of the curriculum’s academic content due to the differences associated with being in a school of public health or a business school or another type of academic setting. In 2015, the median annual salary of an individual with a Ph.D. degree in healthcare administration was $185,000.00. Whether or not you choose to earn professional certifications related to the healthcare management profession is entirely up to you. However, having such certifications will provide invaluable assistance in climbing the highly competitive ladder in this field. There are more than a dozen professional bodies that offer professional certifications for healthcare administrators, and which ones you choose to pursue will depend on the specific career path you have marked for yourself. The AHCAP is a professional association that provides support to leaders in the healthcare industry by offering assistance with professional development. 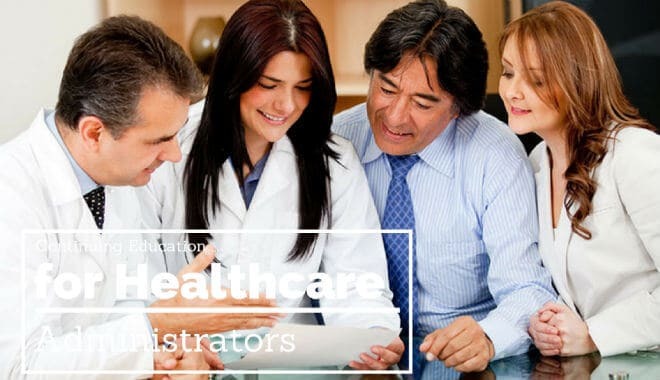 Their most well-known certification is the Certified Healthcare Administrative Professional (cHAP) designation. This certification is bestowed only upon the elite within the industry who have the talent and knowledge and can demonstrate it by passing a proficiency exam. Last, but not least, healthcare administrators and professionals face many challenges on a daily basis. Some of the most commonly cited problems include pressure to reduce operating expenses, evolving regulations, and new advances in technology. In 2016, the circuit for healthcare conferences have been dominated by these topics, and therein lies the value of attending professional seminars and conferences. It offers a chance to learn from experts in the field and provides access to much needed resources. As an added bonus, it also provides valuable networking opportunities. There are dozens, if not hundreds, of conferences aimed at healthcare administrators that are offered each year, so it will not be difficult to find ones that are geared towards your needs.